The Thai Foreign Minister, Mr Surapong Tovichakchaikul, led a group of visited Burma, border town of Myawaddy to meet with Karen State Chief Minister U Zaw Min on 3rd February. migrant workers, border trade, preventing important trade crossing from being closed and increasing goodwill between the two countries. Mr Surapong visited Ban Huay Maha Wong Village in Mae Sot district, the site where Thailand built a concrete embankment that resulted in Burma closing the Mae Sot Myawaddy border crossing for 18 months, causing local traders to lose billions of baht in lost revenue. Mr Surapong told reporters that after just two months of reopening the checkpoints trade between the two countries had risen to 2.4billion baht a month. And the foreign minister was confident it could reach as high as 100 billion baht a year if the checkpoints remain open. Mr Surapong told reporters he would take the opportunity to discuss the issue with his Burmese counterparts when they both will attend the Asean-India Dialogue meeting on 13 February in New Delhi. Thailand has claimed the concrete embankment at Ban Huay Maha Wong was built to prevent soil erosion while Burma has counterclaimed that it changed the borderline. 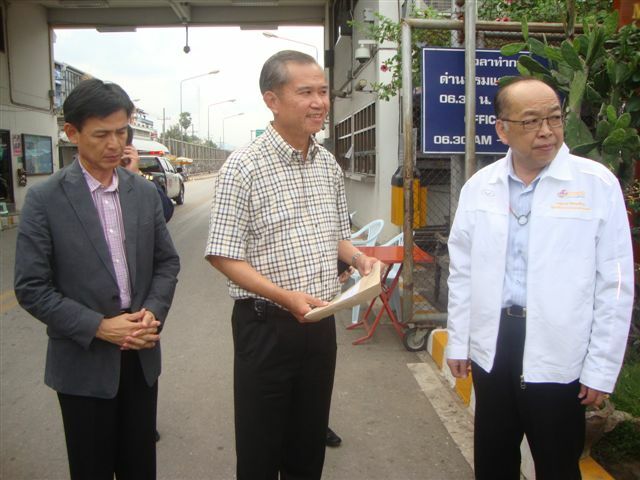 During the 18-month closure of the trade checkpoints Thai governments failed to resolve the issue. Many local observers believe the closure was a move designed to put pressure on Thailand to curtail the movements of Burma pro democracy activists, close refugee camps in Tak province and restrict the Karen National Union movements along the border. Mr Surapong party also discussed the contentious issue of migrant workers with the Burma government’s representatives. Labor organizations and the Burma government has estimated that there as many as 2 million Burmese workers in Thailand. Thailand says the figure is lower at around 900,000 workers.